A quick browse through the website with its amazing 30% off deal, I ended up with a couple of skincare to replenish my current stash in my shopping bag. And next thing I know, it arrived promptly at my doorstep a few days later. I picked up the SK-II Stempower again since I was finishing up my current moisturizer and the deal wasn't something to pass up as it was even better than airport pricing. I also picked up a few things from Mario Badescu which I've been really curious about; the famous Silver Powder and an interesting Seaweed Night Cream. 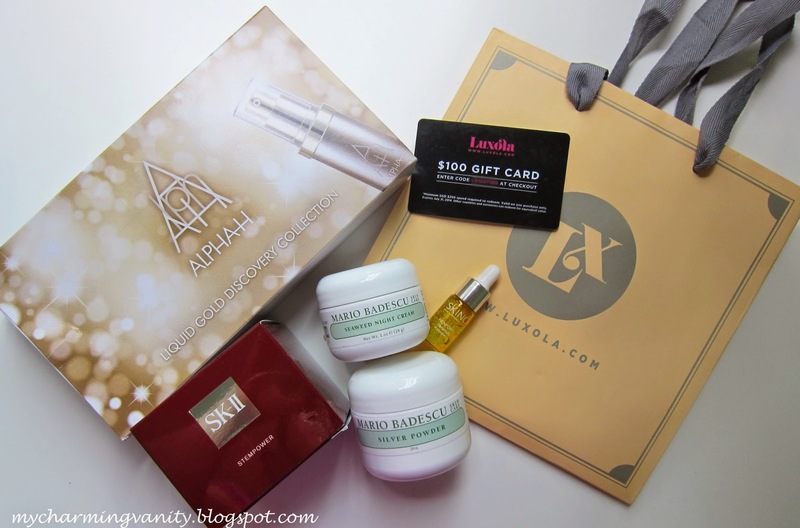 As if I did not have enough skincare, I added on with the Alpha-H Liquid Gold Discovery Collection to try out. Overall, I'd say that I had a rather pleasant shopping experience with Luxola, with a few small hiccups on the delivery end. Other than that, I was pleasantly surprised to be gifted with a small Skin Inc sample, as well as a generous S$100 gift card (though some T&C applies and if you do the match, the gift card sums up to appx 40% discount of next purchase). If you are interested in shoppping for some great brands at affordable prices, you can visit the site here. Wow, the sales sound so good! I remember reading that Singapore is one of the best shopping destinations, and I've been wanting to visit since. Lol.